It was even cleaner inside than this when I got it. Now my neglected pot has gotten some use. 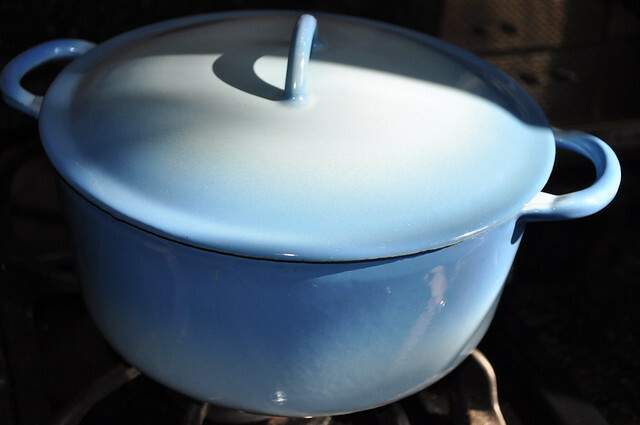 This cool find is my vintage Descoware enameled cast iron pot with lid. It’s the pot that started the obsession and changed the way I cook. I fell hard for this bit of cookware manna from heaven, spending hours researching it until I learned as much as I could, and that, in turn, led me to researching every vintage item in my house! The pot holds 3 quarts of liquid, so it’s sort of a small-ish Dutch (or French) oven, which is a perfect size for a single person who doesn’t go around cooking massive pots of chili on a regular basis. Or ever. Like most of my finds, I didn’t know much about what I was picking up; the piece just called to me. Had to be that striking cherry flame colour! (It’s actually orange, but the manufacturer called it “cherry”.) I found this workhorse of the kitchen at the reuse centre of my local dump. Yes, the dump! Ergo, it was FREE. It was also spotless and might never have been used in its 40-plus years on the planet. Poor pot. Well, first of all, what isn’t special about enameled cast iron? This stuff is a dream to cook with. It has all the great cooking qualities of regular cast iron, (even heating, stovetop-to-oven ready), but because of the enameling it doesn’t require the seasoning that bare cast iron requires. It’s also prettier! Put it on the stove, in the oven, in the fridge and even on the table for serving! Enamel is more durable than Teflon, but metal utensils are still verboten! Stick to wood or silicone. If you’ve got a big enameled cast iron Dutch oven, you can bake bread in it! Descoware pieces with enameled bottoms like the frying pans have Descoware in script stamped on them. The bottoms like this have simply the FE and Belgium to indicate the foundry where it was made: Founderie Emaillerie – or it could be the symbol of iron from the Periodic table…FE. Or just a happy coincidence that both are “FE”. Second on the list of cool find awesomeness is that this is a Descoware pot. Made in Belgium, the name Descoware was used by the American importer for Bruxelles Ware. They started making enameled cast iron in the 1940s. Most people who have any passing interest in cooking are likely familiar with the more famous brand of enameled cast iron out of France that started a little later: Le Creuset. And if you are familiar with Le Creuset, you’ll also be familiar with the price. A new pot similar in size to mine will run you $300-$400. Ouch! (These go for less in the U.S., but not much.) Vintage Le Creuset in this size, with the lid, will run you at least $100, more if it’s in perfect condition like this one. Any description I see for Le Creuset that is under $100 generally starts with the words “miniature” or “tiny”, or is missing the lid/handle/enamel/pot…you get the idea. Vintage Descoware, on the other hand, is much more reasonable by virtue of being less known than its rival. A Descoware Dutch oven (and nearly anything else they made, except, perhaps, for the fabled ‘bean pot’) can be found for well under $100. And here’s the rub: it is said that Descoware is actually the preferred product. The queen of French cuisine herself, Julia Child, preferred the Belgian brand over Le Creuset and used it regularly on her cooking show. Here’s a photo of her cherry flame bean pot on her stove (left) at the Smithsonian. I’ve heard tell that vintage Descoware has held up much better over the years than Le Creuset pieces, even newer ones. Descoware also claimed that their product was 35% lighter than competing cast iron from the time, and if there is one thing that cast iron needs, it’s to lose some weight! What I did to it. Nada. This pot needed no help because it was in perfect condition. However, enameled cast iron needs proper care to protect its finish. See my links below on how to clean and take care of it. A few other care tips include: avoid using it on high heat and never put cold water in a hot pot. Nor should you submerse the hot pot in cold water. And, because it cannot be said enough, no metal shall ever touch the surface of an enameled pot! That includes spoons, forks, and steel wool. That is, if you’re going to sell it. Or buy it. But if you’re going to cook in it? Priceless. Like I said before, compared to its vintage competitors, Descoware pieces in excellent condition can be procured for a bargain–maybe not free, but we can’t all get that lucky. However, since I originally looked up this pot about eight months ago, the prices for Descoware seem to be slowly creeping up as word spreads. Amongst aficionados, and anyone who’s tried it, Descoware has an excellent reputation as brilliant cookware, and since you can still get it for a fraction of the cost of vintage or new Le Creuset or other competitors, like Staub, why the heck wouldn’t you pay less and get more? A shot of the mark on the inside of the lid. Here’s one last tidbit of info: apparently the knob is made of porcelain, so I read somewhere in a random comment that I can’t find back. This is great because it doesn’t get as hot as the cast iron so it’s easier to lift off mid-cook. A blog of useful Descoware info can be found on descoware.com, where else? He also has pictures of the typical Descoware marks so you can compare. The site hasn’t been updated in a while though, so I wouldn’t bother asking questions…they don’t seem to get answered these days. This Frugal Café post has lots of info on the colours and patterns of Descoware, with photos. DescowareLOVE: An Etsy shop that sells replacement handles for the wooden-handled Descoware pans. Unfortunately, no one seems to have any idea what all the numbers and letters on the pots refer to. Likely size, but searches for a “Descoware size guide” come up empty. If anyone knows what they all mean, please, put the rest of us out of our misery and post it in the comments! Thank you. When was it made? Probably near the end of Descoware’s lifespan, in the mid-seventies. What’s it worth? Around $60 on Etsy or eBay. Is it collectible? Somewhat, but I think its time will come. Get it while you can!